Small Business owners must protect themselves in a variety of ways and the search for the best business security systems is an important one to maintain the safetly of a business. Security systems are extremely important and the amount spent on them should be a considerale consideration for any small business owner, whether you own a store, restaurant or operate a business out of your home. Your company is an investment and having the best business secuirty system is an investment that must be made to protect your small business. There are several options when it comes to finding the best business security system. In this day and age, a virtual or physical breach is capable of wiping out everything you have worked to build. The level of protection you desire will most likely depend on the size and type of business you own. Home security monitoring systems offer support at all hours of the day from people who are considered to be alarm specialists while a more modern invention, like the wireless system that requires self-installation. There are also security systems out there that offer small businesses burglar and intrusion monitoring devices. These packages come at a higher rate, but are world it for the owner looking for a top notch business security system. In the digital age, it is important to consider access to an online help center. The fact of the matter is that most secuirty systems still offer help over the telephone because the forefront of the security market is urgent matters that need to be dealt with over the phone and cannot wait for someone to log online and open a chat box or send an email. That being said, for preventive measures like adding features to a given secuirty system, a live chat on a company’s website or an online help center can be helpful. Two-way voice ystems and video surveillance centers that connect small business owners to a given help service have also proven helpful. 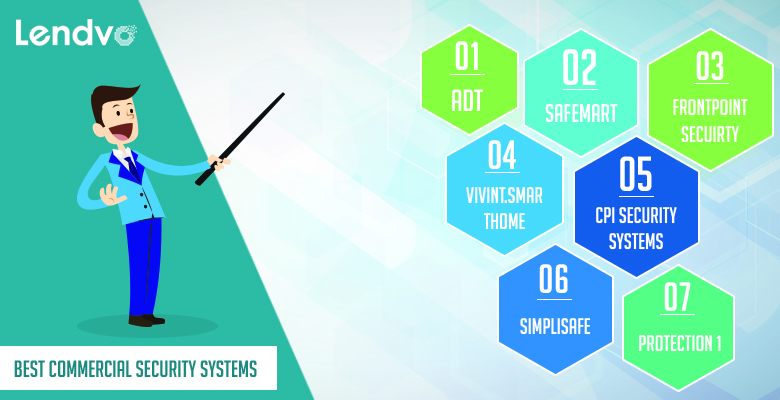 SafeMart is one of the most respected names in the business security system market. SafeMart is a company that does not necessarily install their software and hardware, but their home monitoring services are vast and they allow you to use as many secuirty devices as you may need. SafeMart offers service to the United States and Canada and they have been in the market since 2002. Another perk of SafeMart is that they are quick and efficient when it comes to relocation. Their profesisional support staff is smart, intuivitive and quick on their feet. Additionally, SafeMart allows you to choose from a variety of different providers for your home security equipment necessities. Motion detectors in your home will receive triggered clips automatically with cameras installed. Images are also capturable with ADT’s new technology. ADT also offers surveillance camers which capture pristine, clear images in dark environments as well as those with low-light. They work with a Camera Assistant and their ADT Pulse wireless network installation. This comes with Wi-Fi protected access and state of the art wireless data encyption with a standing /wall mount. Control panels, door sensors, glass break sensors, sirens and emergency botters are also provided features with their package. Additionally, the glass break sensors work to protect your windows and motion sensors capture movements of prospective criminals. The invisibile security system is one of the rarest in the industry and they have one the GOLD award in the TopTenReview. Their smoke and heat sensors are top tier protecting against any monoxide spills, flooding or additional environmental hazards. They also offer online help, email and phone service. One downside is no landline or broadband options; the 3-year equipment warranty can also be a hurdle, but the 30 day money-back guarantee makes up for that. Vivint is one the the highest rated business security systems on the market offering customizable systems for a variety of homes and small businesses. They offer a free quote with no activation fee and will professionally install your software enabling your home to become a smart home. Vivint thermostats are state of the art and use energy safing schedules. Their technology integration is high quality. They have cameras for both inside and outside as well as a Doorbell Camera, a SkyControl Panel that controls all your smart home needs in one place and Smartlocks with Mobile access. In addition to their cameras, Vivint offers 24/7 video recording to its customers. Vivint.SmartHome offers home secuirty monitoring for small businesses throughout the USA at affordable rates of $39.99; the home automation and monitoring services begin at $49.99. The premium cameras are also $3.33 per month and smart door locks come in at $2.67 per month. Vivint Flex pay offers the option to pay for your equipment in either 42 or 60 months. Once you finish your payment, you will own the equipment. Vivint creates its own technology and offers third-party integration with services like Nest and Amazon Echo. The home automation service provides the best control panels and wireless integration service available on the market. SimpliSafe is known for having its award-winning home security system that utilizes wireless technology to seamlessly protect your home from burglary. The business security system is BBB + Rated, has won an Angie’s List Super Service Award and a CNET Editor’s Choice Award. The hardware costs bare $15 per month and the technology itself costs $230. No phone lines are needed and they offer fast cellular connection, on-the-go mobile control, secret alerts as well as SMS text and email alerts. Their wireless sensors also have an unusually extreme range in addition to impressive smoke and fire detection capabilities built into their monitoring system. Additionally, the monitoring comes with 20% discounts from most major insurance companies. An upside to SimpliSafe service is that there is no minimum contract. There is also no early termination fee if you are not happy with their services. To balance out their upside, the customer service is not 24/7 and is only offered from 9am-6pm EST by phone and email support. Unlike other companies, you have to install the hardware yourself; so, it makes sense their price point is where it is, but their 24/7 monitoring is still a competitive service in the business security system industry. When all is said and done, the installation process is relatively simple to do with the instructions provided and the flexibility to cancel when you please or downgrade your service is nearly unmatchable in the industry for the video surveillance protection they do offer. CPI Security Systems are available in two different formats including a Security Package or a Smart Home Security Package. The Security Package consists of anywhere up to 20 pre-wired Contacts or 7 Door/Window Sensors for your protection. The state of the art equipment also includes a motion detector, high-speed cellular communication with real time response with audio and video certification. The intouch App allows you to see and manage everything going on in your home or at your business from your phone. The Smart Home Secuirty Package is the other option that also comes with the contacts, door and window sensors, app and cellular communication. The modern touchscreen keyless door lock iInside, they provide an interior HD camera or outdoor wireless HD camera and all installation is freel. The app additionally gives you access control allowing for entry points and access points in your location to be controlled and your employees to be protected. The video interface offers the possibility of recording events of any alarm that goes off and you can be notified immediately with a video clip. Similarly, the fire alarm monitoring system triggers a response from the fire department. They also offer a rare glass break detector, motion detector, wireless light control, key remote, medical pendant, carbon monoxide detector and a unique exterior HD wireless IR bullet camera. Their technology bending equipment offerings allow them to only offer packages when you provide your information via telephone or on their website. Customer care is available 24/7. Protection 1 is another top tier small business security system expert. They are a business solution used and respected by a lot of small business owners. Protection 1 provides local service and support on a national level and its services are provided to people on the market for innovative security products. Their experts will handle the installation for you including their video solutions which can be used in your home, store, venue or anywhere else you may need to take care of probms at your place of work. Monitoring is done by specialists in UL certified monitoring centers and the experts work on a 24/7 basis, 365 days a year. Other services they offer are fire and life safety, intrusion alarms to protect against robbery and burglary, in addition to access control systems which protect your main entrances and essential areas of your business. Protection1 also offers a unique Tech Tracker to let you know who is entering and elaving your home in addition to when they did. The Maintenance Rewards are also available to all national account customers on over 100 websites that are protected by Protection 1 showing the large reach of the company and how well respected they are by business owners to protect their homes. Protection1 has a unique National Account Program benefit which allows for better equipment inventory on all security equipment offered by the company. Their 1 Report is also a unique offering unseen by others in the industry that provides you with information to better make your decision on security problems and changes you may need to make in your system. Their benchmarking works alongside this as a tool to allow you to track how your system is doing in comparison to others. Information is also provided by eSuite Account Management that gives you date and the ability to create custom exception reporting and receive notifications that matter to you. Cisco is behind their integrated IT team and the engineering and program/project management are close to being the best in the business and highly recommended by their customers. The pricing plan for Protection1 is not listed on their website. At the end of the day, it is up to you for who you want to choose tto protect your small business. Things that need to be taken into account are the size of your business, your employees as well as your trust for your employees since employee theft is one of the leading causes of burglary in the United Stated. Other things to take into account are whether you feel you need state of the art technology or not based on your needs. If your information is highly classified you will probably need an intense integrated system from your provider. A good idea is to make a chart of pros and cons offered by different national security provicders across the country and evaluate them with other business partners you hav. Fire, carbon monoxide, door alarms and window alarms are pretty common things you should look for from any businss security provider you are considering. Additionally, whether or not you need a wireless system is something to consider; if you are the type of small business owner who wants to be able to see what is going on at your venue or store when you are not there, this is definitely a plus. Also if you want to receive a notification if a glass mirror breaks or a door is brokern into, you will want to receive a notification to an app on your phone rather than have an unpleasant surprise when you come home. At the end of the day, any of the business security providers listed above should be suitable for your business needs. The goal is to choose something that will not put you into debt, but rather that will act as a preventive measure against any burglary or crimers that you may fave in the future. A dollar saved is better than a dollor lost and that is the burpose of small business security providers. For additional tips, visit our resources page as we will continue to update the business security providers as new technology comes out weekly in this digital age.